49 killed, 42 injured in attacks at 2 mosques. 2 in critical condition, including a five-year-old child. Gunman returned to vehicle, then resumed shooting. Police confirm finding IEDs attached to a vehicle. Australian Brenton Tarrant with reported racist manifesto charged with murder. 2 others also arrested but unclear if directly involved in crimes. Security threat level in New Zealand raised to second highest level. The 28-year-old man charged with murder in the deadly mass shootings at two mosques in Christchurch has appeared in court and will face further charges, New Zealand’s police commissioner has announced. Brenton Tarrant showed no expression at the court appearance, where more than 10 armed guards were present. The appearance lasted only about a minute, before Tarrant was led back out in handcuffs. He was ordered to return to court again April 5. None of the victims’ family members were seen. Details on what the additional charges might be were not immediately available, but police commissioner Mike Bush said they will be released at “the earliest possible opportunity.” Two other suspects remain in custody as police work to determine what role they played. Meanwhile, the country’s prime minister said officials will be probing whether those behind the shootings should have been on the radar of authorities. “If there was any suggestion that these individuals should have been known to us, we are looking into that as we speak,” Prime Minister Jacinda Ardern said at a press conference Friday. Two of the injured are children, one a four-year-old girl in critical condition. A total of 39 people remain in care, hospital staff said. They range in age from the very young to elderly, the majority male aged 30 to 40. Four of those initially taken to hospital died before they could arrive, Christchurch Hospital’s chief of surgery Greg Robertson said. “People’s lives have been changed forever,” Canterbury District Health Board CEO David Meates said. Australian media reported Tarrant is from the city of Grafton in New South Wales, Australia. Police did not immediately say whether they suspect the same person was responsible for both shootings. Ardern said police are still investigating whether two more people who were also arrested were directly involved in the crimes. Police did not release any details about them, except to say that none had been on any watch list. A 74-page manifesto was posted on social media under Tarrant’s name, identifying the gunman as a white nationalist who was out to avenge attacks in Europe that were perpetrated by Muslims. Ardern said the accused had not come to the attention of police for any sort of extremism. Officials are now looking into whether his social media or other activity should have triggered a response. The prime minister also said the accused was not a resident of Christchurch but was a resident of Dunedin, the second largest city on New Zealand’s South Island. He had also travelled “around the world,” Ardern said. Reuters reports the accused had spent time in Turkey but further details were not immediately available. Broadcast on live video, the attack in Christchurch — home to nearly 400,000 people, and approximately 440 kilometres from the capital of Wellington — sent shock waves across the nation of five million people. Police have urged the public not to repost the livestream. Shots rang out at Masjid Al-Noor, a mosque in the central part of the city, around 1:45 p.m. local time on Friday. Police said 41 of the victims were killed there. In the live streamed video, the killer spends more than two minutes inside, spraying terrified worshippers with gunfire. He then walks outside, where he shoots at people on the sidewalk. Worshippers, possibly dead or wounded, lay huddled on the floor, the video shows. Children’s screams can be heard in the distance as he returns to his car to get another rifle. He walks back into the mosque, where there are at least two dozen people lying on the ground. After going back outside and shooting a woman there, he gets back in his car, where the song Fire by the English rock band The Crazy World of Arthur Brown can be heard blasting. The singer bellows, “I am the god of hellfire!” and the gunman drives off. 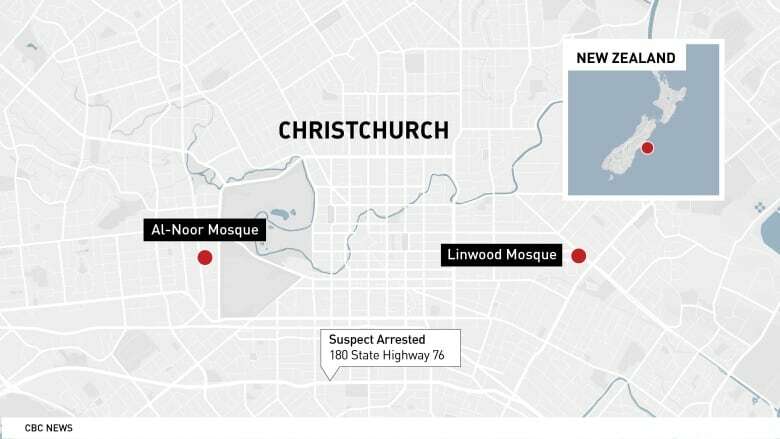 The second attack took place at the Linwood mosque about five kilometres away, where police say seven were killed. Another later died in hospital. Based on the video, the attacker was at the scene of the first mosque for about 10 minutes, and police did not arrive until after that. The footage showed he was carrying a shotgun and two fully automatic military assault rifles, with an extra magazine taped to one of the weapons so that he could reload quickly. He also had more assault weapons in the trunk of his car, along with what appeared to be explosives. Facebook, Twitter and Google companies, including YouTube, scrambled to take down the video, which was widely available on social media for hours after the attack. The “primary perpetrator” appeared to have had five different firearms on hand, including two semi-automatics and two shotguns. He had a gun licence acquired in Nov. 2017 and the guns were legally acquired, Ardern said. That’s prompting officials to review New Zealand’s gun laws. Video of the accused gunman’s arrest shows officers surrounding a vehicle that had been struck by a police cruiser. 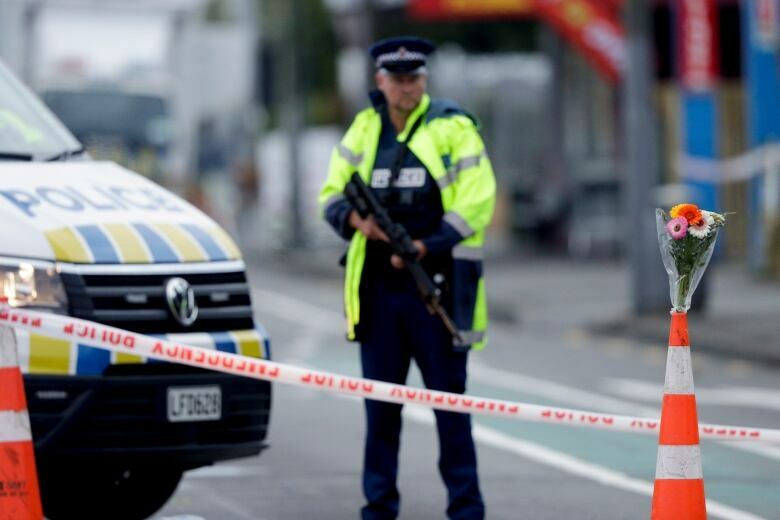 Ardern said the national security threat level in New Zealand was raised to the second highest level after the attack. “It is clear that this can now only be described as a terrorist attack,” said Ardern, calling it an “extraordinary and unprecedented act of violence,” and saying many of the victims could be migrants or refugees. Ardern praised police for their work in apprehending suspects and disarming the explosives that were attached to a car. Bush later clarified it was two improvised explosive devices (IEDs) on a single vehicle. While there was no reason to believe there were any more suspects, the prime minister said the national threat level was raised from low to high. 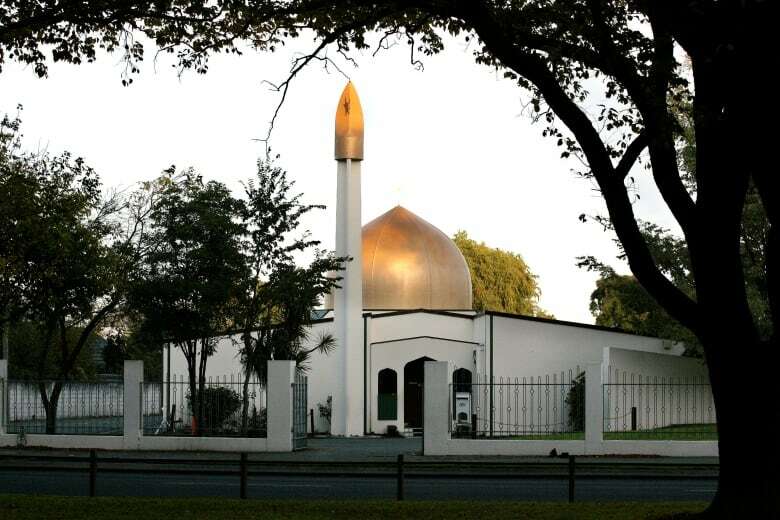 Police warned Muslims against going to a mosque anywhere in New Zealand. Air New Zealand, meanwhile, cancelled several flights in and out of Christchurch. Syed Ahmed was among the lucky ones who survived the shooting at the Linwood mosque. Ahmed, who was in the first row when the imam started prayers, told CBC Radio’s As it Happens he heard gunshots go off outside the window to his right-hand side. “I heard three or four shots, and people started falling down and everybody started to take cover. There were a few people falling down, and he was shooting indiscriminately” and there were women screaming. The elderly who were sitting in chairs along the wall were among the first to be shot, he recalled. He fled the mosque to try to find help and couldn’t get back inside when police arrived. Mohan Ibrahim ran outside as soon as the gunman started shooting and then could hear continuous shooting for 10 to 15 minutes, he told CBC News. “I don’t feel safe,” he said. Tweets from the account, suspended not long after the shootings began, also showed rifle magazines covered with the names of historical figures, as well as Alexandre Bissonnette, who shot and killed six men inside a Quebec City mosque on Jan, 29, 2017. Police said the investigation extended 360 kilometres to the south, where homes in Dunedin were evacuated around a “location of interest.” They gave no details. Indonesia’s Foreign Ministry said an Indonesian father and son were injured in the shootings and taken to Christchurch Hospital. The ministry said the father is in intensive care. The man’s wife, Alta Marie, said on Facebook that Zulfirman Syah and their son were at the hospital. The International Red Cross set up a web page to help people contact family members who may have been at the mosques during the shootings.